While many canary owners are happy to keep their pets as caged songbirds, it is possible to tame a canary so he'll happily sit on and interact with you. It takes patience, but the rewards are worth it. These birds are intelligent; they make great companions once they've been tamed. If you don't yet have a canary, picking the right specimen will streamline training. It's easiest to train a bird less than 6 months of age, so make sure you buy a young one. You should choose the bird that is most curious and engaged when you come over to look at the flock, rather than one that shies away. However, all canaries have the capacity to learn, so if you already have a canary you want to tame, go ahead. It may take a little longer. Set a strict training routine. Two daily sessions of 10 to 15 minutes in length should suffice. Make sure you have these sessions at the same time each day. This way your canary will become accustomed to the routine and may even come to anticipate his training session when it gets to the right time of day. Canaries are nervous birds -- a natural response to predators -- so you need to be patient with them. 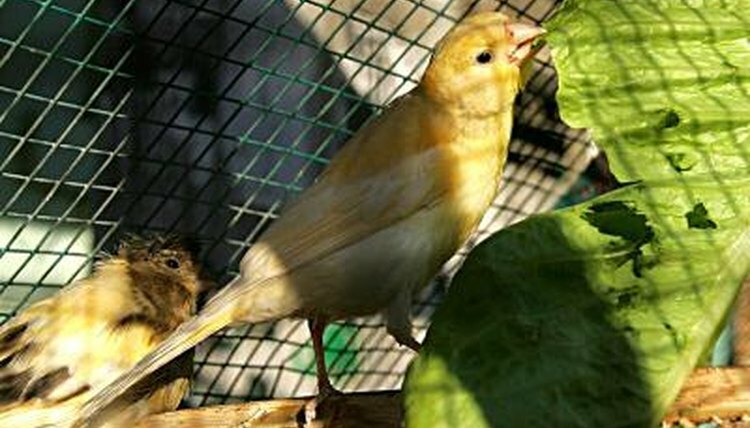 Start by placing your hand in the cage, with you fingers straight and horizontal, so your bird can use them as a perch. Eliminate gaps around your hand and the cage opening through which he can squeeze out. Hold on to a treat to lure your bird to you, these birds especially like soft, leafy greens, such as lettuce. Wait for as long as necessary for your bird to hop on your hand. Never chase him or try to catch him -- he'll only become scared of you. If he doesn't come to you after 10 or 15 minutes, remove your hand from the cage and try again next time. If your canary seems especially stressed out while he's perched on your hand or while you have your hand in his cage, stop working with him immediately, returning him to his house if he's outside of it. One obvious sign of stress in these birds is the appearance of panting, much like a dog. A stressed-out canary is an unhappy one. Never continue training if he's in that condition.